From Farmington, New Mexico drive approximately 35 miles south on the Bisti Highway to the sign marking the south entrance to the wilderness. 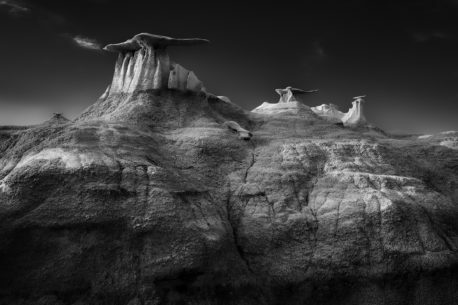 Bisti/De-Na-Zin Wilderness is an abstract world of nature's design filled with the most unusual of formations, a B&W photographers dream, where a creative eye guides you to your next composition. However, for all that makes it special, it is also a challenging and remote backcountry wilderness, no roads, no trails, and no maps. The Wings are located in the north end of this wilderness area.